Quotes from California’s first Wine and Weed Symposium, held in Santa Rosa by the Wine Industry Network. 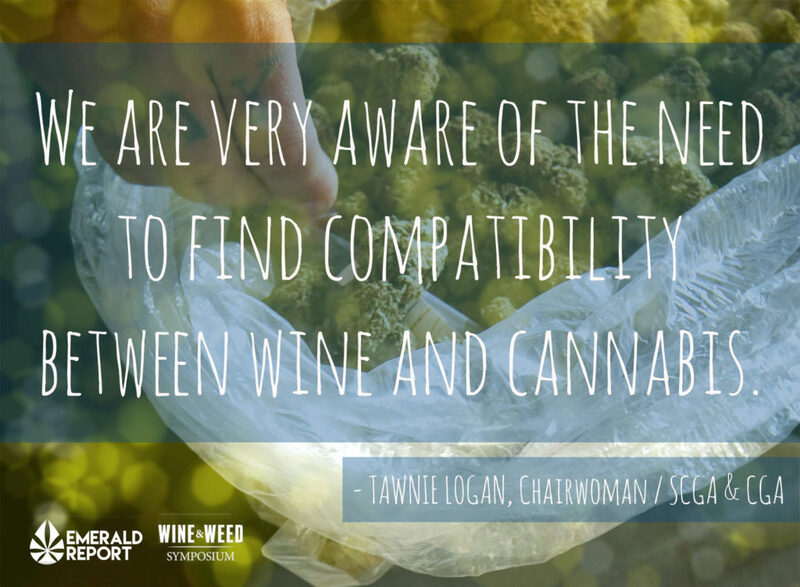 We are very aware of the need to find compatibility between wine and cannabis Tawnie Logan, chairwoman scga/cga Quotes from California’s first Wine and Weed Symposium, held in Santa Rosa by the Wine Industry Network. 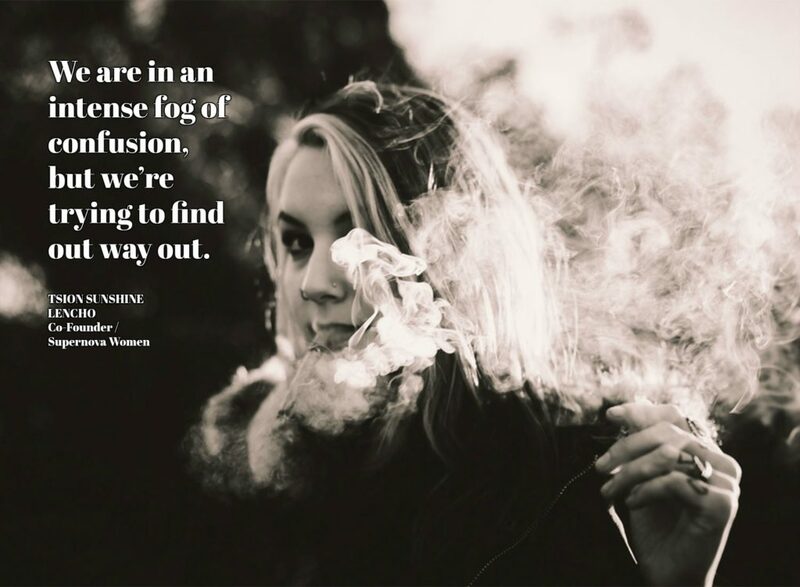 We are in an intense for of confusion, but we're trying to find a way out. Tsion Sunshine Lencho Supernova Women. Quotes from California’s first Wine and Weed Symposium, held in Santa Rosa by the Wine Industry Network. 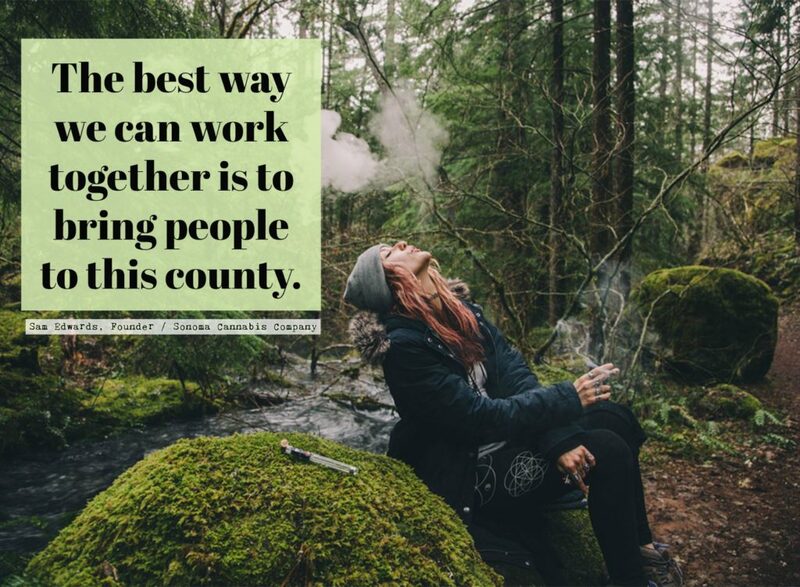 The best way we can work together is to bring people to this county. 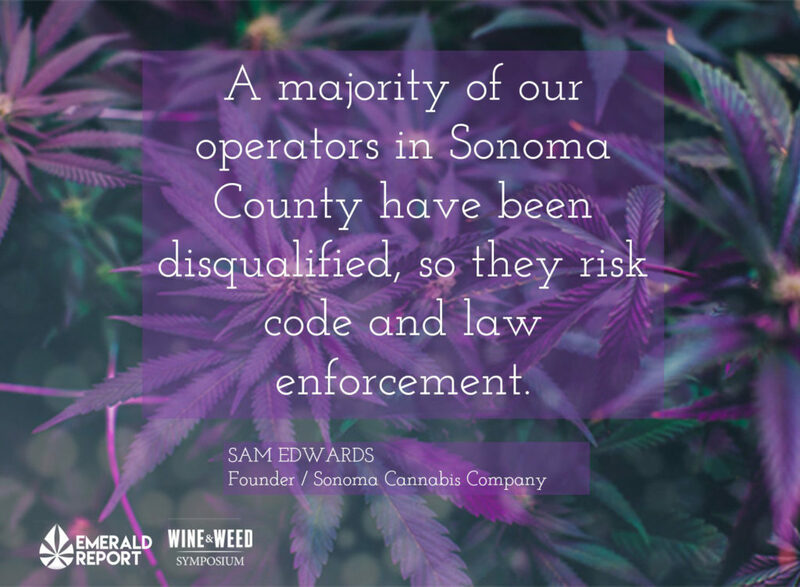 Sam Edwards/Sonoma Cannabis Co. 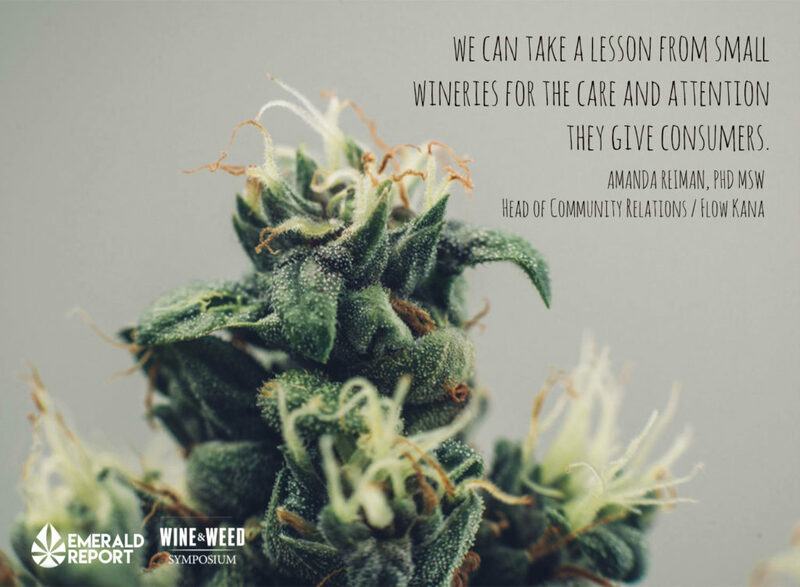 Quotes from California’s first Wine and Weed Symposium, held in Santa Rosa by the Wine Industry Network. The heart of California's Cannabis industry is built on the backs of small family farmers. We need to ensure they survive now and into the future. Sen. Mike McGuire. Best case scenario. 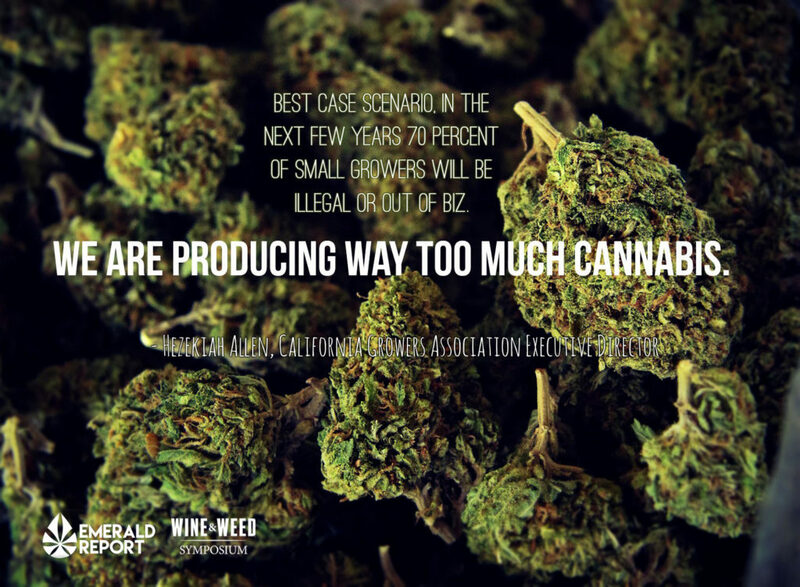 In the next few years 70 percent of small growers will be illegal or out of biz. We are producing way too much cannabis. Hezekiah Allen, California Growers Association Executive Director. Instead of popping ambien or xanax, this plant is a solution for women--to help them balance their lives. 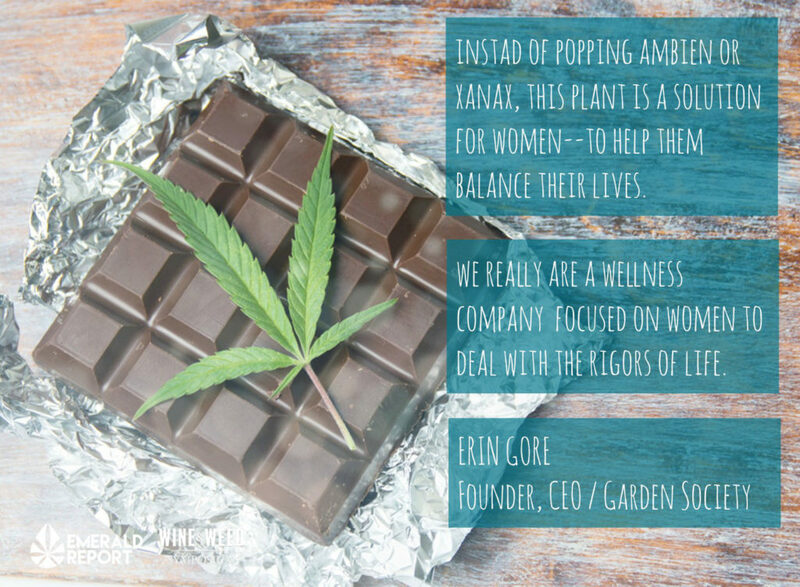 We really are a wellness company focused o women to deal with the rigors of life Erin Gore, Founder/CEO of Garden SOciety. Quotes from California’s first Wine and Weed Symposium, held in Santa Rosa by the Wine Industry Network. 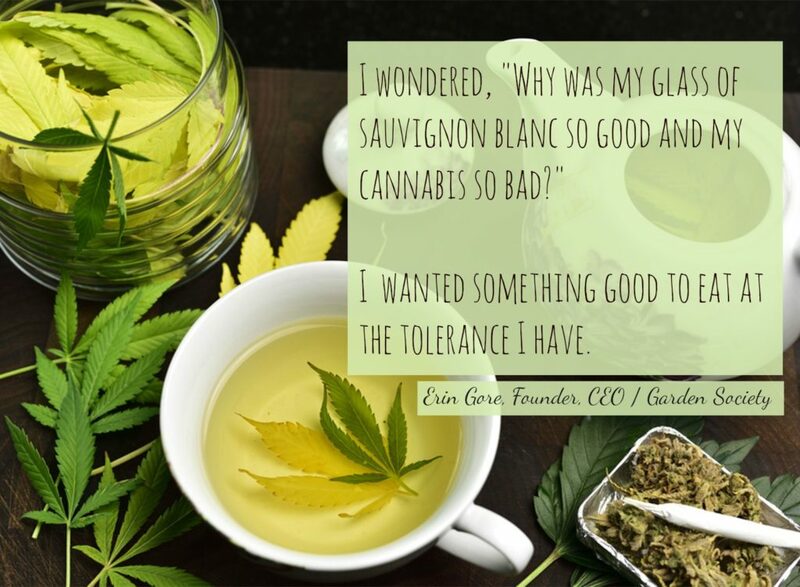 I wondered, "Why was my glass of sauvignon blanc so good and my cannabis so bad?" I wanted something good to eat at the tolerance I have. Erin Gore, Founder Garden Society. 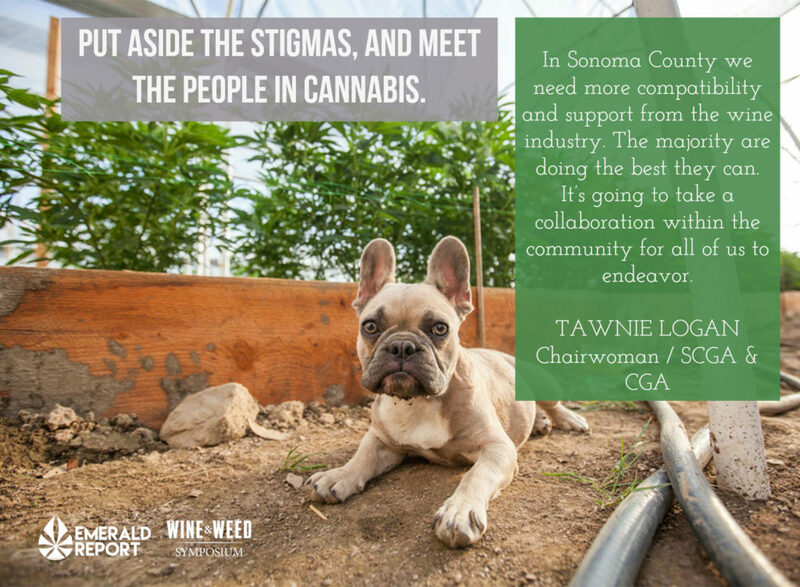 Quotes from California’s first Wine and Weed Symposium, held in Santa Rosa by the Wine Industry Network. 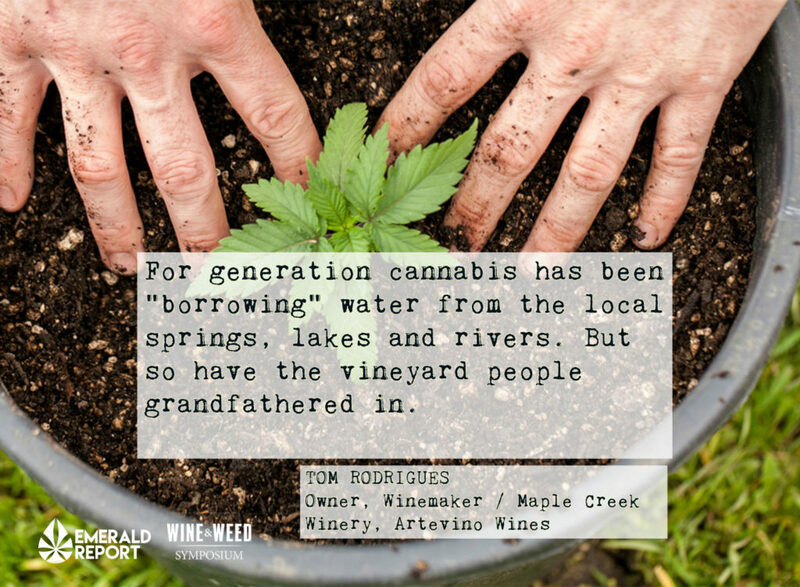 There's no reason we can't share appellations--but we have to get winery and cannabis people in the same boat. But that might be hard. It's changing a mindset. 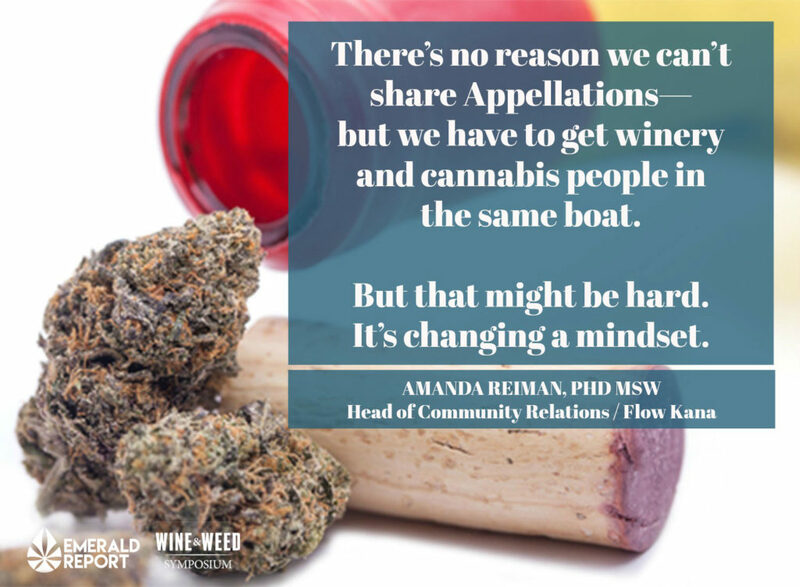 - Amanda Reiman/Flow Kana Quotes from California’s first Wine and Weed Symposium, held in Santa Rosa by the Wine Industry Network. Marijuana needs to be descheduled. Rescheduling would be a catastrophe. Hezekiah Allen, Director California Grower's Associayopm/ Quotes from California’s first Wine and Weed Symposium, held in Santa Rosa by the Wine Industry Network. There are opportunities in cannabis, but it's certainly complicated. It's not a casual endeavor. It's going to involve a lot of legal help to realize that goal. Rebecca Stamey-White Hinman& Carmichael LLP. 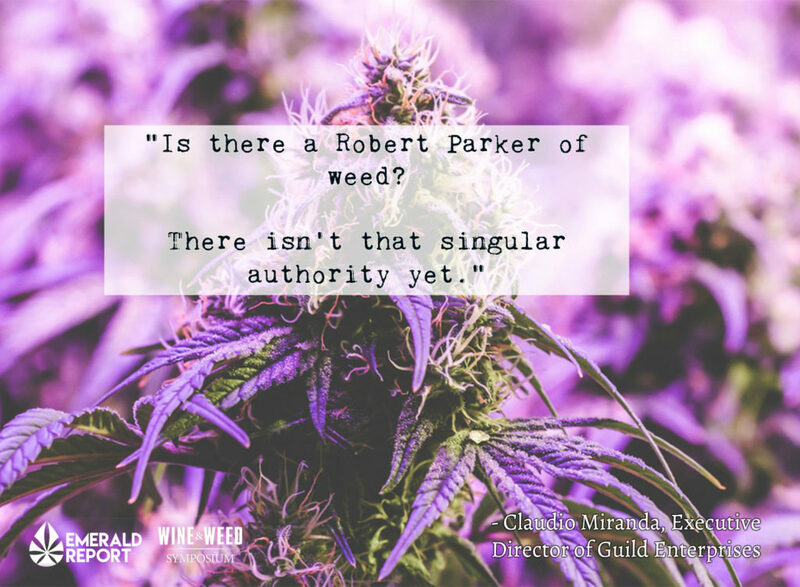 Is there a robert parker of weed? There isn't that singular authority yet. Claudio Miranda, Executive Director of Guild Enterprises. 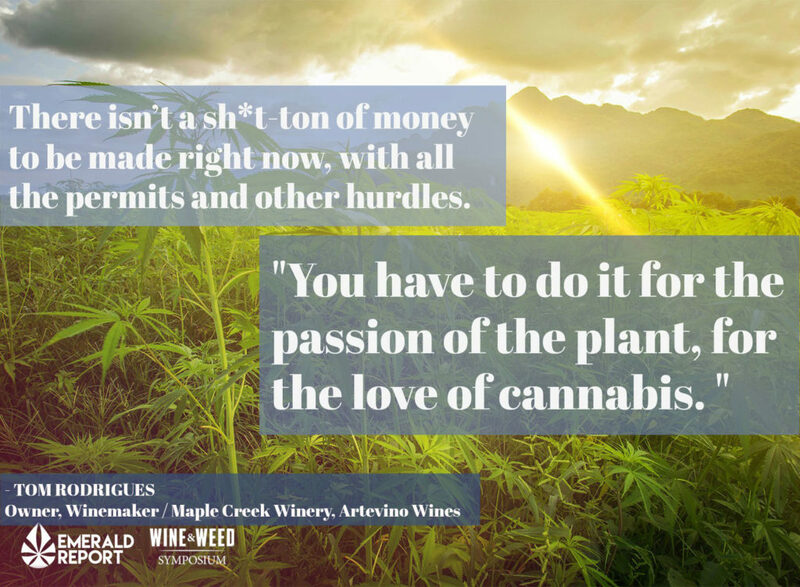 Quotes from California’s first Wine and Weed Symposium, held in Santa Rosa by the Wine Industry Network. We are all searching for economy of scale. I hope everyone stays alive in the county. But it may have to burn out and reinvent itself into what that story is. 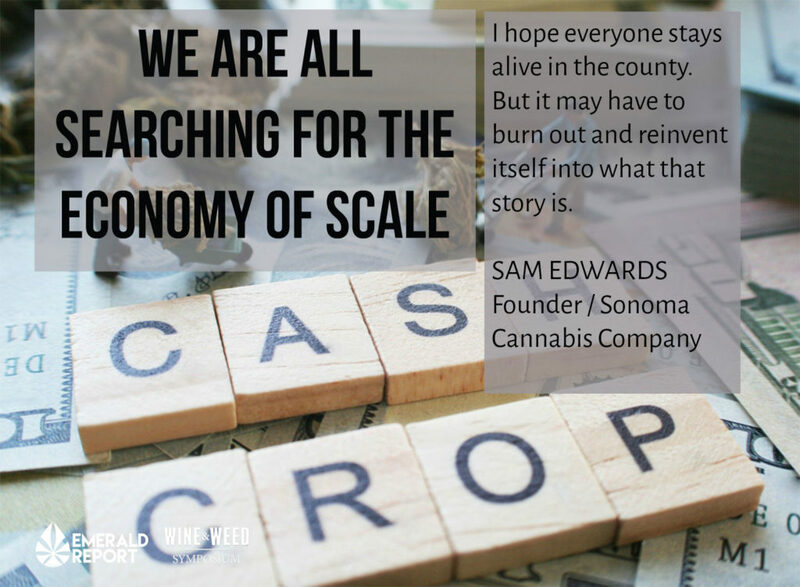 Sam Edwards/Sonoma Cannabis Company. 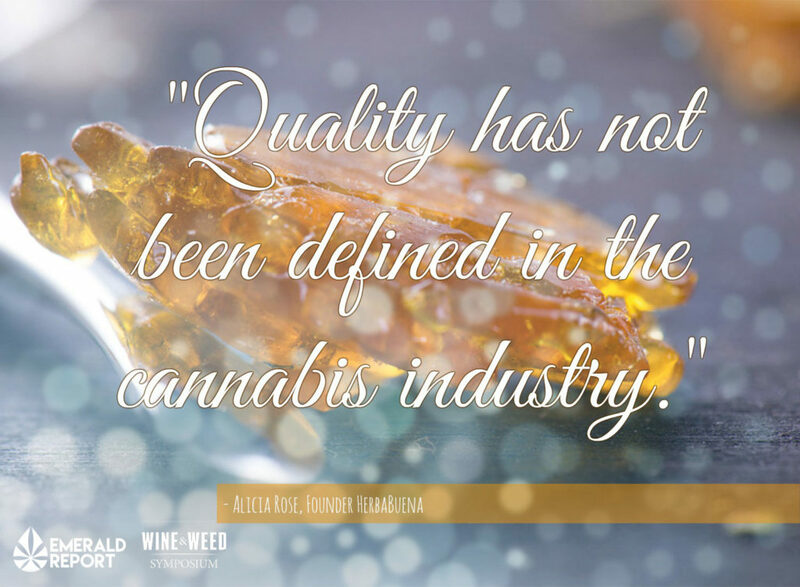 Quotes from California’s first Wine and Weed Symposium, held in Santa Rosa by the Wine Industry Network. There isn't a sh*t ton of money to be made right now, with all the perits and other hurdles. You have to do it for the passion of the plant, for the love of cannabis. Tom Rodrigues, Owner, Winemaker/Maple Creek Winery, Artevino Wines. 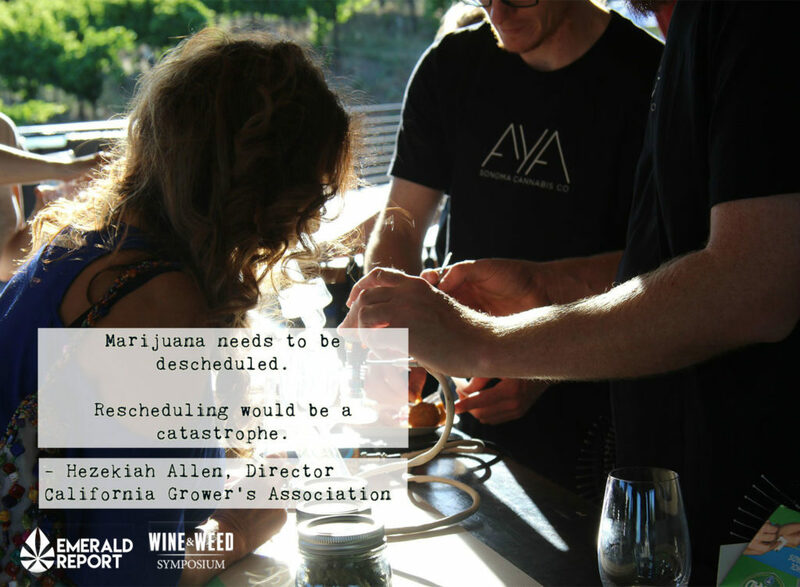 Quotes from California’s first Wine and Weed Symposium, held in Santa Rosa by the Wine Industry Network. "There are a lot of people in the Wine Industry who don't want to have this conversation But this is the fastest growing agricultural business we'll probably see in our lifetime. Tom Rodrigues, Owner, Winemaker Maple Creek Winery, Artevino Wines. 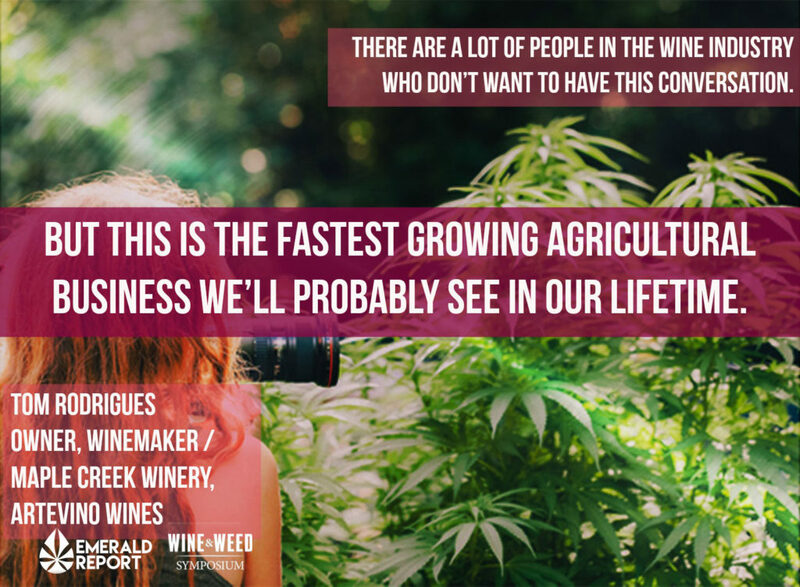 Quotes from California’s first Wine and Weed Symposium, held in Santa Rosa by the Wine Industry Network. Though the recent Wine and Weed Symposium may have left both local winemakers and cannabis growers with many more questions than answers, the two mega-agricultural industries in Northern California came together to cautiously sniff each other out at the one-day event. With billions of dollars at stake on both sides, it’s still a tenuous relationship, knowing that they’ll be competing for natural resources, people and market share. 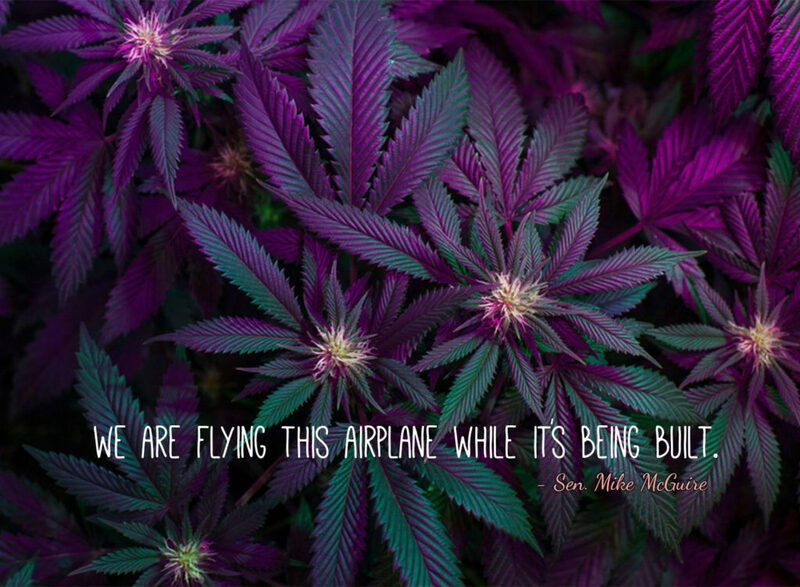 But cannabis is here, a 500 pound gorilla that winemakers are realizing they have to acknowledge sooner rather than later. The sold out event drew a mixed audience of growers and owners in both industries, but panels focused mainly on educating the wine industry about weed, rather than the other way around. Speakers included Sen. Mike McGuire, whose district encompasses prime grape and cannabis growing regions including Del Norte, Humboldt, Lake, Marin, Mendocino, Sonoma and Trinity Counties; Hezekiah Allen of the California Growers Association; Sam Edwards of Sonoma Cannabis Company; Tawnie Logan of the Sonoma County Growers Association; cannabis business owners, winemakers, lawyers and others trying to navigate the complicated state, local and federal laws regarding the adult use of cannabis. 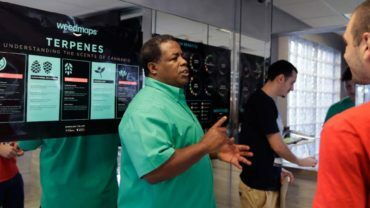 The event was a sort of show-and-tell to those outside the cannabis industry featuring emerging business and thought leaders in the marijuana business. Still coming out from the shadows of a loosely regulated and federally illegal industry, the jury’s still out about whether the culture of cannabis and wine will jive on the North Coast, finding a comfortable collaboration or factionalization. At least everyone’s talking. And that’s a start. Here are a few takeaways from the event. Lawmaking for the cannabis industry is facing an uphill battle, with state and local issues of permitting and zoning of greatest concern. Cannabis has much stricter rules on pesticide use than grapes. Overspray from vineyards could result in serious problems for marijuana growers. Cannabis-related tourism is on the horizon, but there are still many questions about the legality of tasting rooms, etc. Cannabis growers aren’t keen on winemakers getting into the biz, mostly because some feel that there is already enough being grown in the state, and prices will plummet. Not to mention the maze of regulations. 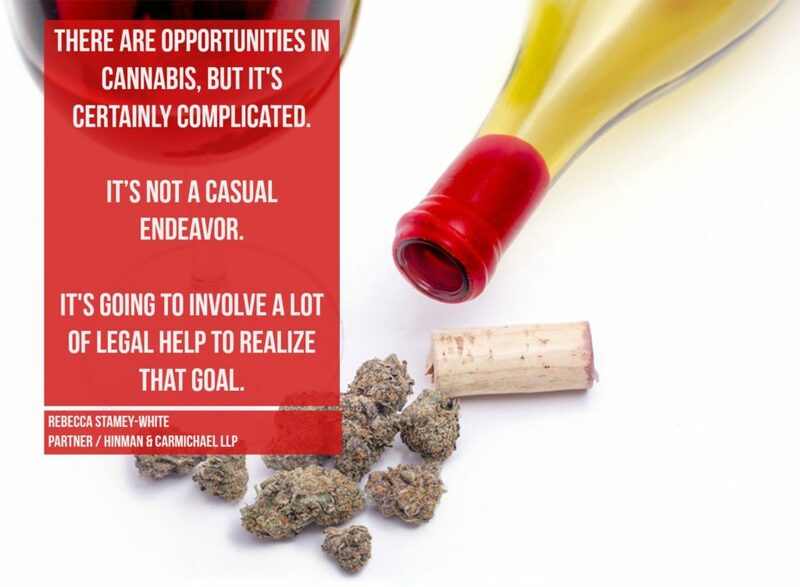 Many in the cannabis industry are looking to the wine industry for guidance as they navigate this new world of legality. Appellations are a huge issue for the North Coast/Norcal cannabis industry, since Mendocino and Humboldt are already well-known for high quality marijuana. Whether “appellations of origin” or designations that correspond to wine AVAs come to pass is important to growers. We’ve created some slides with the most quotable takes from the event above. Press Room: Here’s what the media is saying about a wine and weed collaboration.